The anti-skid regulation (also known as Traction Control) optimises traction to prevent skidding of the wheels, by acting on the brakes of the driving wheels and on the engine. The electronic stability programme acts on the brake of one or more wheels and on the engine to keep the vehicle on the trajectory required by the driver. These systems are activated automatically each time the vehicle is started. They come into operation in the event of a grip or trajectory problem. This is indicated by fl ashing of this warning lamp on the instrument panel. In exceptional conditions (starting a vehicle which is bogged down, stuck in snow, on soft ground...), it may be advisable to deactivate the ASR and ESP systems, so that the wheels can move freely and regain grip. Press the "ESP OFF" button, located on the left below the steering wheel. If this warning lamp comes on in the instrument panel and the indicator lamp on the button comes on, this indicates that the ASR and ESP systems are deactivated. 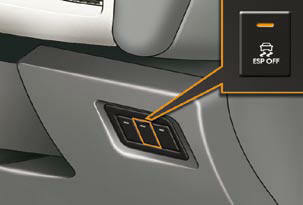 These systems are reactivated automatically each time the ignition is switched back on or from 30 mph (50 km/h).